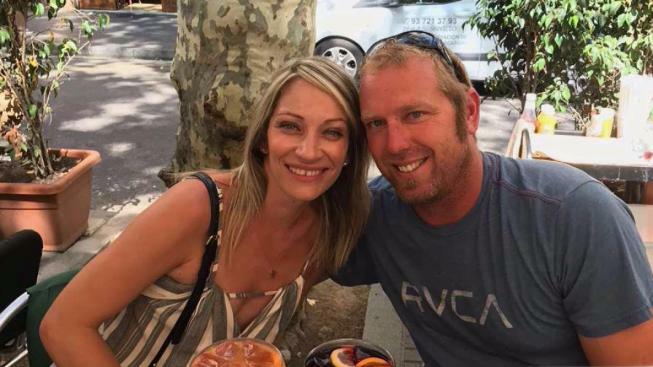 A Bay Area woman is desperate to find her husband who went missing after a van plowed through the crowds in central Barcelona. Pete Suratos reports. UPDATE (Aug. 18, 2017): Jared Tucker was one of the 14 people killed in Thursday's terror attacks in Spain, his family said. A Bay Area woman is desperate to find her husband who went missing after a van plowed through the crowds in central Barcelona, killing at least 14 people —one from the United States — and injuring more than 100 others. Heidi Nunes said she and her husband, Jared Tucker, were in Europe celebrating their first wedding anniversary, visiting Paris and Venice before arriving at the Catalan city. A Bay Area woman is desperate to find her husband, who is still missing in Barcelona after what authorities are calling a terrorist attack. The couple, from Walnut Creek, California, was walking in Barcelona's Las Ramblas shopping district when Nunes decided to look at some jewelry while Tucker went to use the bathroom. Moments later, a van veered onto the promenade and barreled down the busy walkway in central Barcelona on Thursday, swerving back and forth as it mowed down pedestrians and turned a picturesque tourist destination into a bloody killing zone. "Next thing I know there’s screaming, yelling," Nunes told NBC News. "I got pushed inside the souvenir kiosk and stayed there hiding while everybody kept running by screaming, and then the police eventually made us evacuate." Nunes said she has not seen or heard from Tucker, a 34-year-old construction worker, since the deadly attack. She told NBC News that she's aware of a picture circulating online appearing to show her husband looking injured and being helped by a stranger. A picture taken moments shortly the attack depicts a happy couple enjoying sangrias on the promenade. Nunes said the clothes he was wearing in that photo "is what he’s wearing now," and hopes that detail provides a clue and helps someone to recognize him. She said she has reached out to the U.S. embassy in Spain for help and has called local hospitals searching for him. 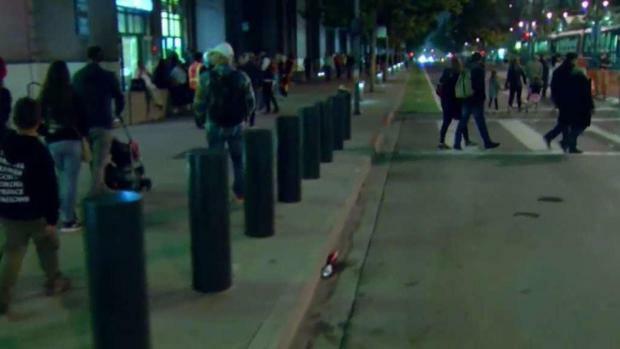 For the second time in less than a week someone has driven into a crowd and turned a vehicle into a deadly weapon. It is prompting local law enforcement agencies to consider new strategies to help protect large groups of people. Sergio Quintana reports. "We’re waiting for a list at the emergency places we’re at but the lists don’t seem to be updated very rapidly," she told NBC News. "So we were going to start driving to hospitals to start looking." One American was killed in the attack, while another sustained minor injuries, a State Department official told NBC News Friday. Neither was identified, and Spanish authorities say several casualties have yet to be identified. A biographical page for Nunes on the El Sobrante Christian School website says the sixth-grade teacher grew up in Sacramento and "enjoys spending time with her son and attending his soccer and lacrosse games." San Jose resident Caroline Bet Adam, who is also in Spain on vacation, told NBC Bay Area she got off a bus moments after the attack and saw people screaming and running. Her family is shaken but safe. Another Bay Area resident, Isaura Ochoa, is studying abroad in Europe and was just blocks away from the deadly scene. "Everything seemed out of control," Ochoa said. "All of a sudden people started running in opposite directions of where everything was -- everyone ran into a store." A Bay Area woman studying in Barcelona shared dramatic cell phone video of her experience after the deadly attack. Jean Elle reports. Early Friday morning, five people carrying fake bomb belts were killed in a shootout with police in Cambrils, a seaside resort town about 80 miles from Barcelona. Six people, including an officer, were injured in the attack. The government for Spain's Catalonia region said the back-to-back vehicle attacks were connected and the work of a large terrorist group. 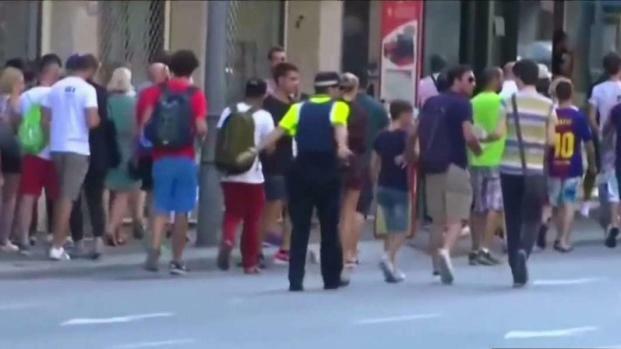 Four people have been arrested, but the driver of the van in the Barcelona attack fled on foot and remained at large Friday morning.